According to Lauren Mullenholz who spoke on October 8, 2015 at the LinkedIn Sales Connect conference in Las Vegas, those with SSI (Social Selling Index) scores above 70 achieve 200% more meetings, opportunities and new clients compared with their peers. Who wouldn't want to outperform their fellow sales people and competitors by 200%? Lauren's video is at the end of this post and includes a case study explaining how Microsoft is modernizing the way they sell with LinkedIn. The screenshots below are from the video. The average SSI score within LinkedIn globally has gone from 21 to 28 in the last 12 months with North America and Australia leading the world with an average just over 30. 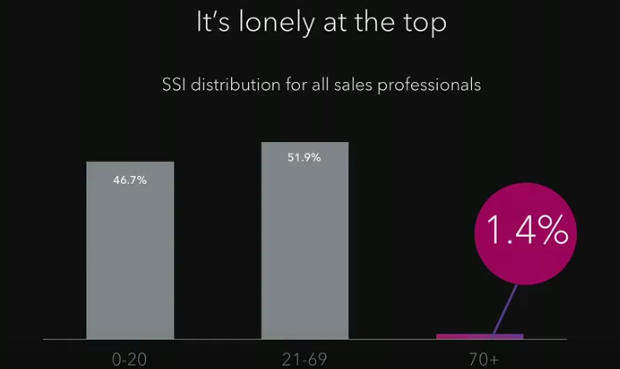 But it's lonely at the top... achieving an individual SSI score of 70 or above places you in the top 1.4% of LinkedIn members. Click here forhow to create a strong personal brand in social with LinkedIn. I've personally achieved a SSI score of 90 and the business results have staggered me. If you're serious about modernizing and improving the way you sell, thenknow the business case for social selling and create your own specific strategy. You can download a free white paper I've written defining 'strategic social selling' here (no form to complete). Many companies around the world are modernizing the way they sell by embracing social selling. The illustration below shows the results that Microsoft are achieving in three distinct areas: Enterprise partners / resellers, direct corporate sales and direct sales into the government sector. Watch the video at he bottom of this post to hear their story and how they are achieving these results. Lauren's LinkedIn video below also features Phil and Brian from Microsoft with their case study. It's ideal to use during a 'lunch and learn' session with key executives inside your own organization. Introduce it by asking: "Could this be the way to modernize the way we sell?" If you would like to see your own SSI score and understand how SSI scores are created, read this blog post. Without doubt, there is a problem in B2B selling. Gartner Research believes 85% of interactions between businesses will be executed without human intervention by 2020. Buyers are clearly in control today and in many B2B sales organizations only 40% to 60% of sales people meet or exceed their sales targets. I believe that 30% of B2B field sales people won't have jobs in professional selling by 2020 and this will be due to their inability to adapt to the forces of commoditization and disruption to deliver the necessary value to funds their roles. Inadequate management is a key contributor to poor sales performance and sales managers need to focus on coaching and driving the activities and behaviours that create success in their teams. According to Jason Jordan, co-author of Cracking The Sales Management Code, 83% of sales metrics being reported in systems such as CRM cannot actually be managed. Sales people need guidance to become truly consultative and create the right conversations and value for both customer and employer. According to Corporate Executive Board research, 95% of buyers expect insight from the seller yet 86% of sales people fail to differentiate. Forrester research findings state that 85% of sales engagements fail to meet buyer expectations. Sales teams need to step up and execute at a higher level and when they do, the results are transformative. According to Corporate Visions research, 74% of buyers choose the seller who first provides insight and value. The best sellers don't talk about themselves, what they do and how they do it; instead they establish their credentials before a meeting to instead focus on why the conversation is important and what can be achieved for the customer supported by a strong business case. The biggest issue for sellers is therefore securing meetings with the right people at a point in time where they are able to shape requirements and help set the agenda. When leads come to the sales organization it’s then very difficult to exert the right level of influence and that’s because buyers are typically 57% (Corporate Executive Board) to 70% (Forrester Research) through their change and procurement process. According to IDC research, 75% of buyers research the seller before meeting or agreeing to engage. The key to influence is obviously early engagement yet a Harvard Business Review article highlights that 90% of decision makers never respond to cold outreach and according to Corporate Executive Board research, 97% of cold calls yield no result. The corollary of the negative statistics is in research conducted by C9 Inc who found 7 times more pipeline and 11 times more revenue (36 companies and 9,000 sellers) with those who embraced LinkedIn’s Sales Navigator tool. LinkedIn themselves analysed a cross section of new and existing sellers who increased pipeline by 45% and the probability of achieving their sales targets by 51% simply by improving their standard LinkedIn social selling index (SSI) scores. According to Steve Richard at Vorsight, “In B2B selling only 3% of your market is actively buying at any given time, 57% are not ready and 40% are poised to begin.” Importantly, their buyer’s journey begins online and this is why social selling matters. 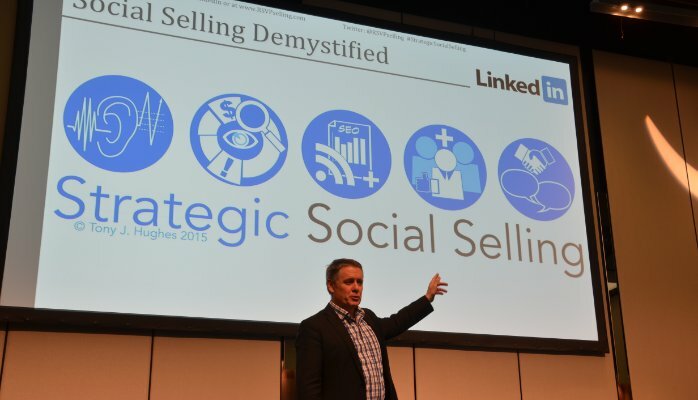 Social selling also matters because social buying is a reality – we live in the age of massively empowered buyers. Our customers can research and commoditise what we offer with just a few clicks. They can assess our assertions of value and then introduce competitors with ease. Sellers therefore need a framework for attracting customers through strong personal and corporate brands that enable early engagements of influence. Individuals as well as corporations need social strategies for complex business-to-business (B2B) selling where, according to CSO Insights, there are on average 6 people involved in the typical buying decision. Social Selling Definition: The strategy and process of building quality networks online that attract clients and accelerates the speed of business and efficiency of selling, as achieved with personal human engagement through social listening, social publishing, social research, social engagement, and social collaboration. On a foundation of a strong personal brand I have identified the 5 pillars that enable the best results in social: 1) Social Listening/Monitoring, 2) Social Research, 3) Social Content Publishing, 4) Social Engagement and 5) Social Collaboration. The business case is simple. Those B2B sellers who consistently improve their LinkedIn SSI scores increase pipeline by 45% and the probability of achieving their sales targets by 51%.